Si View Picnic Shelter: Host your event at the Si View Picnic shelter! With a shelter rental, you won’t need to worry about unpredictable weather, you’ll have shade from the sun, or cover from the rain. Shelter rentals start as low as $75 for a five hour block. 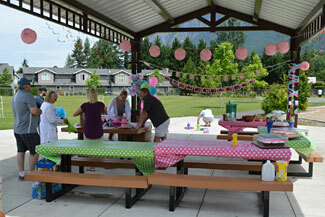 Picnic tables are on site and playground is just feet away, all you have to bring is your own decorations and guests. Once your event is complete just dispose of trash in the garbage cans provided. It doesn’t get much easier than that! Groups over 50 guests may also need to rent the field.